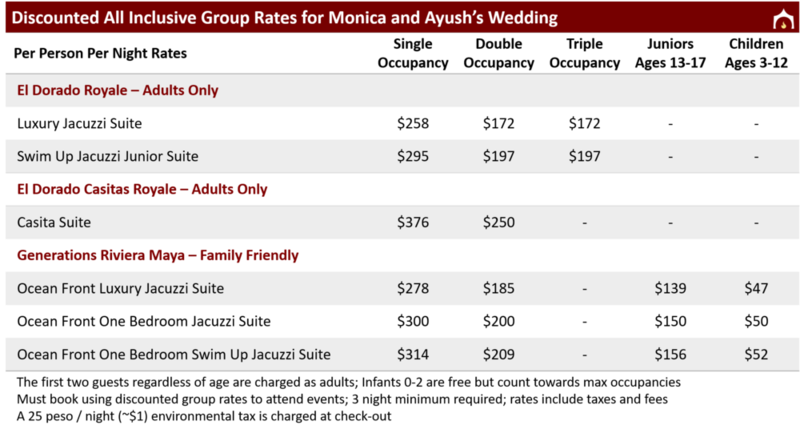 Monica and Ayush have secured discounted group rates for guests of their wedding! Please book by April 5, 2019 so we can prepare for your attendance of events; though you MUST be booked through their group block on this site by May 5th, 2019 latest in order to secure the best discounted rate, to attend wedding events, to be included in group promotions, and to be given priority access to rooming requests and be placed in the group block located near the bride and groom's group. Booking outside of the group block (including on the hotel’s website directly) is not allowed. Generations and El Dorado have a 3 night minimum stay required, but many extend their time in paradise as discounted rates are valid August 13 - August 20, 2019. Travel to Mexico requires valid passports, even for US Citizens. Please ensure that your passport expires after February 2020 (6 months from the date of entry into Mexico). Mexico has no visa requirement for US Citizens, but you will be asked to fill out a FMM form (Mexico's visitor permit) on the plane or once you land. Once you get to immigration and customs at Cancún airport, the agents will give you the bottom half to retain until you leave the country. It is VERY important to keep this secure until you leave Mexico. Monica and Ayush have secured negotiated rates for transfers in Cancún! We will share more details closer to the wedding date.